All of the results from the image processing steps are saved in the zip file you downloaded. Several different types of analyses are automatically done on each image set, below you will find a few instructions on how to find a few of the most common properties measured in focal adhesion dynamics experiments. You can also find short descriptions of all the results files here as well. FA_number: This is a unique number assigned to each adhesion during the tracking process. p.value: The p value calculated for the likelyhood of seeing the determined assembly/disassembly properties occuring by chance. r.squared: This is the value of R² for the log-linear line fit. image_count: The number of images included in the phase. phase_length: The total realtime length of the phase in minutes. If you want to dig deeper into the results, visualizations of each adhesion and the measurements of the intensity of the adhesion marker at each image is also available. You can find the visualizations in the "single_ad" folder in "visualizations", where each file is named using the same number as appears in the ad_num column of the results file. You can see a graph of the intensity measurments and the corresponding assembly or disassembly phase in the Average_adhesion_signal.pdf file in the models directory of adhesion_props. In this file, the title of each graph is the same number as in the ad_num column. Finally, if you want the raw intensity data, you can look at the Average_adhesion_signal.csv file in lin_time_series. Each line of the CSV file corresponds to a single adhesion, where the line number corresponds to the ad_num column. Several properties of the FA's stability phase are also measured and saved. To be present in this file, the adhesion must have an assembly and disassembly phase where the p-value of the log-linear fit is less than 0.05. The image_count and FA_number properties are the same as in the assembly/disassembly property file. These properties haven't been used any publications, but they might be of interest. Some of the following values use a normalization scheme to attempt to correct for differences in FA marker intensity. Thus the normalized intensities values are found by dividing the intensities of FA marker by the average of the first and last intensity values in a given FA's intensity time series. mean_intensity: The average of the FA marker intensities during the stability phase. mean_fold_change: Average of the normalized intensity values during the stability phase. stdev: The standard deviation of the normalized intensity values during the standard phase. coeff_of_var: Result of dividing stdev by mean_fold_change values, the coefficient of variation. half_peak_time: Amount of time between the time when the assembly phase hits half of the stability mean intensity and when the disassembly phase hits half of the stability mean intensity. You can see a graph of the intensity measurments and the corresponding assembly or disassembly phase in the Average_adhesion_signal.pdf file in the models directory of adhesion_props. In this file, the title of each graph is the same number as in the ad_num column. Finally, if you want the raw intensity data, you can look at the Average_adhesion_signal.csv file in lin_time_series. . Each line of the CSV file corresponds to a single adhesion, where the line number corresponds to the ad_num column. 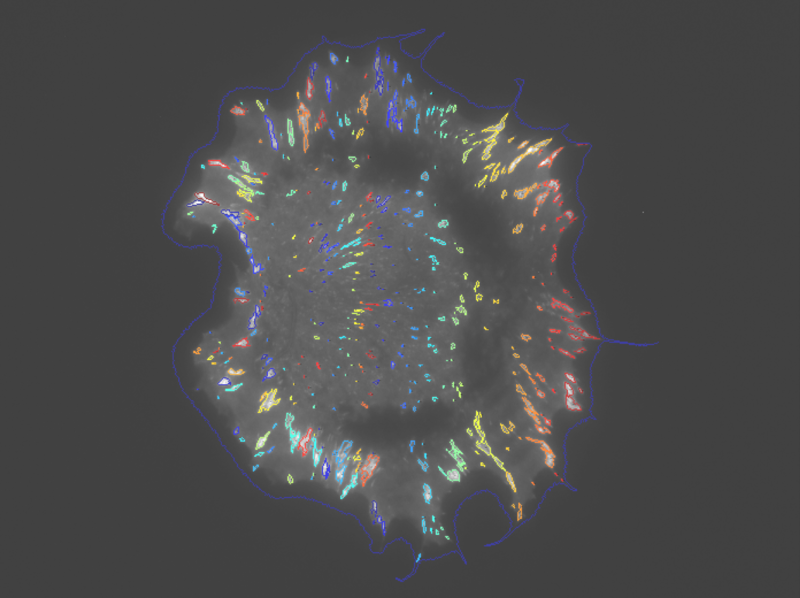 Several different properties are collected about each focal adhesion identified by the system. These properites, such as area and intensity are stored in two ways: as single measurements associated the adhesions in each image and as measurements over time associated with the adhesions tracked through time. The single measurements are all in the sub-folders of the "individual_pictures" folder, specifically the "raw_data" folder. There you will find various csv files such as "Area.csv" and "Average_adhesion_signal.csv" which contain area values and intensity values respectively. All of the units of distance or area are in pixels or square pixels. In addition to static properties collected by the system, several dynamic properties are also collected. These properties are summary properties of a single adhesion over time, even if the adhesion was only present in the movie for a single frame. These properties can be found in the 'single_lin.csv' file in the 'adhesion_props' folder. The calculated properties include longevity (lifetime), largest adhesion area, mean area, mean FA marker intensity and axial ratio. If a cell mask set of files are provided, the average distance from the cell edge and cell center are also included. You can lookup the value of the FAAI in the "adhesion_orientation.pdf" file in the "adhesion_props/FAAI" folder. The value of the FAAI is reported in the title of the left hand plot in the center row. assembly_rows_lengths.csv: Simple file containing the FA number and the length of the corresponding assembly phase. Has been used in the visualization steps to produce small multiple images of single adhesion assembly phases. disassembly_rows_lengths.csv: Same format as assembly_rows_lengths.csv, but for the disassembly phases. Average_adhesion_signal.Rdata: Intermediate data for the rate models, formated for the R programming language. Average_adhesion_signal.pdf: Diagnostic images for the rate calculations, shows all the assembly/disassembly phases ploted with R-squared and rates. All of these files relate to calculating the FAAI and FA angle measurements. FA_orientation.Rdata: Intermediate data for calculating the FAAI values, formated for the R programming language. FAAI_angles.csv: The angles of the FA rotated to the dominant angle, used to calculate the FAAI. This folder contains sets of FA properties organized into matrix format. Each data file is arranged in the same fashion, on each row are the properties of a single adhesion and in each column are all the properties from the adhesions present in a single image. For the adhesions that haven't been born or have died, NaN is used as placeholder value. Several of the properties rely on the presence of a secondary marker to use to find the boundary of the cell. These properties aren't calculated when the secondary marker isn't present. I also calculate the overall cellular centroids in two ways, depending on the data available. When only an FA marker is present, I calculate the "FA centroid", which is simply the average of the x and y coordinates of all the FA found in the image. When the secondary cell boundary marker is present, I also calculate the "cell centroid", which is the unweighted centroid of the pixels in the cell body. Angle_diff_from_radial.csv: The difference in angle between the line leading from the FA centroid to the individual FA major/minor axis angle. Angle_to_center.csv: The angle between the cell mask centroid and the individual FA centroid. Angle_to_FA_cent.csv: The angle between the FA centroid and the individual FA centroid. Area.csv: The area of the adhesion. Average_adhesion_signal.csv: Average value of the FA marker intensity. Centroid_dist_from_center.csv: Distance from the cell mask centroid to the individual FA centroid. Centroid_dist_from_edge.csv: Distance from the cell edge to the FA centroid. Centroid_x.csv: Location of the unweighted FA centroid x component as returned by regionprops. Centroid_y.csv: Location of the unweighted FA centroid y component as returned by regionprops. CHull_dist.csv: Distance from the convex hull edge to the FA centroid. MajorAxisLength.csv: Length of the major axis of an ellipse fit to the adhesion. MinorAxisLength.csv: Length of the minor axis of an ellipse fit to the adhesion. Orientation.csv: Angle between the major axis and the positive X axis. Suppose you have been looking at the FA highlight visualizations in 'visualizations/tracking' and want to connect an FA you see highlighted to the extracted data in the other results. In order to do this, you need to find the FA ID number that uniquely identifies that FA in the rest of the data files. 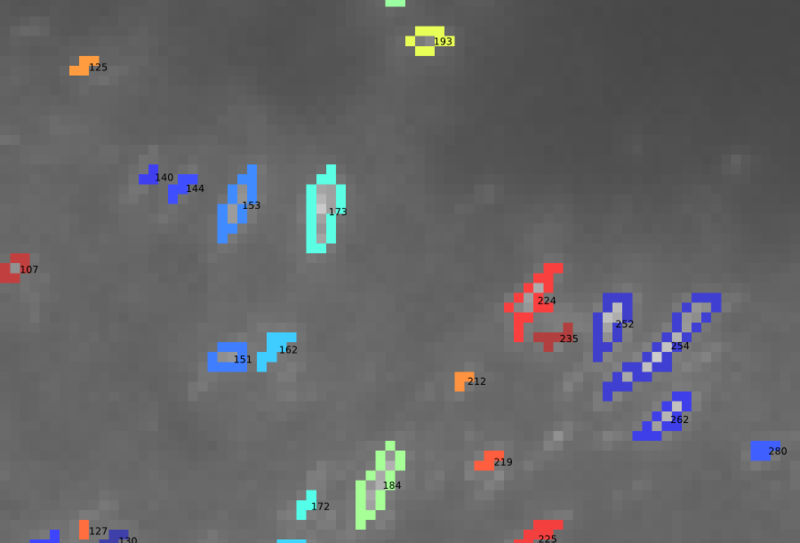 The processing pipeline produces a set of visualization files that mirror the files in 'visualizations/tracking', but have FA ID number labels on each FA. Although the ID numbers aren't the easiest to read, especially in areas of dense FAs, the ID numbers will always be to the lower right of each FA. I had to make the ID numbers that small to make it possible to see the numbers without too much overlap. You can double check the ID number by opening another svg image from the folder, which also contains the same adhesion. This is the same ID number used in all the files in 'adhesion_props'. It also corresponds to the row number in the 'lin_time_series', so if you find your FA ID number is 1000, all the row number 1000s in csv files in 'lin_time_series' corresponds to your FA. By the way, this solution isn't all that great, but I'm open to other ideas on how to link from the visualizations to the raw data. Feel free to get in touch with me if you have any ideas.